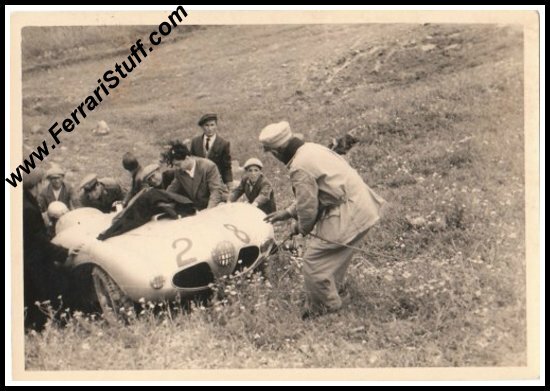 Vintage 1953 Photo of Giulio Musitelli on Ferrari 166 MM Abarth S/N 0262M at the Targa Florio. 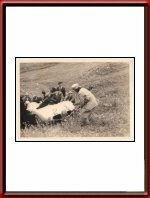 This is a vintage 1953 photo of the Abarth-bodied Ferrari 166MM of Giulio Musitelli being towed back onto the road after an off into a field during the 1953 Targa Florio which he would still finish in 21st place. The car, S/N 0262M, was originally delivered as a Vignale Spyder in March 1953 but quickly rebodied as a Spider by Abarth for the May 1953 Targa Florio (its maiden race). In 1954 it was again rebodied, this time by Scaglietti and again as a Spyder. In recent years it has been brought back to its Abarth body style again. It seems to reside in the USA now. The photo measures some 4 x 3 inches or 10 x 7 cm and is in excellent condition. The back carries the stamp of Randazzo in Palermo, Italy along with some penciled annotations.